GERMBLOCK come in a variety of standard colors. Choose from our selection to match the theme of your Family Fun Center, Childcare Facility, Playroom, or other location. Or, mix the colors to create a vibrant, colorful atmosphere to attract and excite young children. Custom colors are available on special order. 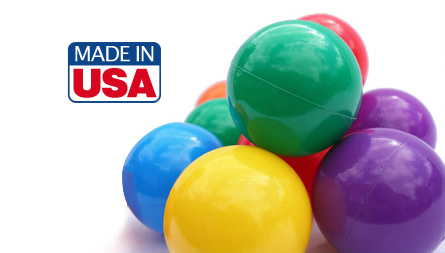 You can order GERMBLOCK customized in special colors for reasonable additional cost, or with your logo molded onto the surface of the ball for a separate tooling fee. Clear balls with a subtle tint of colors from the rainbow. Packaged 150 per box $69.95 FOB factory.